Gutman relates the story of the Knights of the Order of St. John to Spade. How, in 1539, they hit upon the idea of sending a golden falcon, encrusted beak to claw with precious stones, to King Charles V of Spain as tribute. The story he tells places the San Francisco-set noir in a (fictionalized) historical context stretching back through the 16th century to the Crusades. Gutman describes the Crusades as essentially centuries of sustained looting. The Order of St. John can pay such lavish tribute thanks to the Order's legacy of plundering untold hordes of gold, silks, ivory, jewels, and the like from the East hundreds of years earlier. Not schoolbook history, but history nevertheless, he assures him. 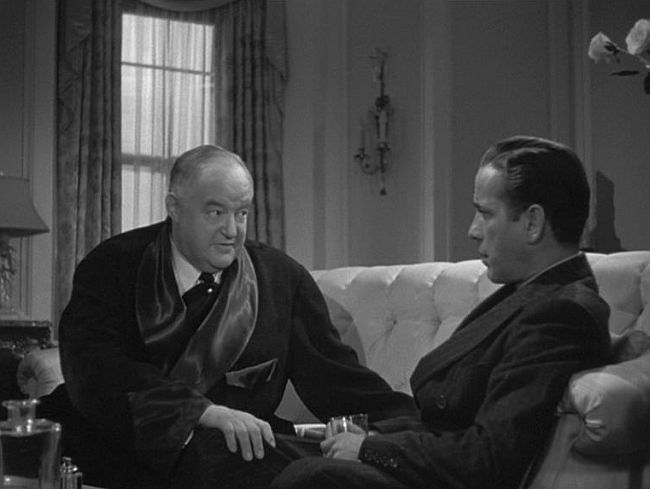 However, the historical motifs in The Maltese Falcon run deeper even than the Crusades. Hammett subtly, elegantly weaves a lyrical legend from Herodotus's history of the Persian wars into his pulpy detective story. Or, since I can't prove it, I've imagined that he has. It's part of the charm of Hammett's novel, and Huston's 1941 adaptation, that such a reading is possible. Ships under the command of Mardonius, serving the Persian King Darius the Great, were caught in a storm in 492 B.C. while on an expedition to Greece. The Greeks, unfamiliar with doves, were fascinated by the site of the white birds escaping the sinking ships. They imagined, the story goes, that the doves were the last messages of love from the drowning sailors. The romantic idea made it's way into seafaring lore, and into song. From 1861,versions of the "La Paloma" ("The Dove") gained popularity in Spain, Cuba, and Mexico. This image, of a dove escaping a shipwreck, flying with a message of love, is not directly found in The Maltese Falcon, of course, but we see its dark reflection in Hammett's tale. Brigid O'Shaughnessy, on the run with the stolen black statuette of a falcon, meets Captain Jacobi in Hong Kong and entrusts him with the treasure. 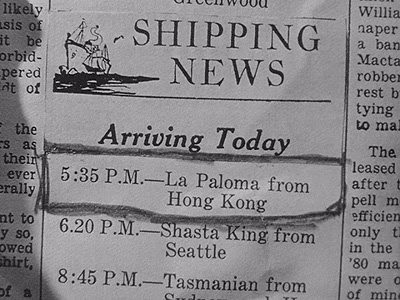 He transports it to San Francisco for her while she tries to find a way to get rid of her no longer convienent ally, Floyd Thursby. Jacobi's ship is burned in the harbor when Gutman's henchman, young Wilmer, is careless with matches while attempting to find it in the hold. The falcon, dove-like, escapes the ship with Jacobi, and later is delivered to Spade's office by the bullet-ridden (again, Wilmer at work) ship's captain. Spade receives his love's black bird; but its message is of betrayal, and it brings death and blood with it from its downed ship. Jacobi's ship is named "La Paloma."